Poet in the City presents a series showcasing some of the most exciting new voices in poetry. Acclaimed International poets, rising stars, and some of the UK’s best new performance poets, will come together in a unique celebration of the power of words. 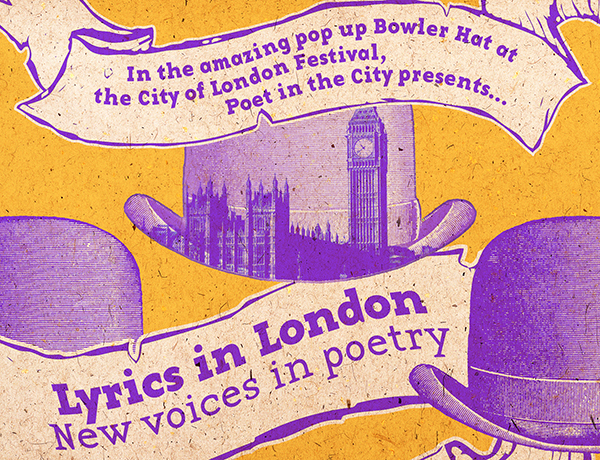 Come and experience poetry as you’ve never seen it before – inside London’s biggest bowler hat! * Drawing on the unique Bowler Hat venue, the artists will explore London from all angles, from the surreal to the sublime! Living London will feature a live art performance by Stacy Makishi, flash fiction and wordplay by Femi Martin and poetry by Antosh Wojcik. London Calling – Monday 14 July 6.30pm – Celebrating the publication of My Voice: A Decade of Poems from The Poetry Translation Centre, this event showcases the outstanding contemporary poetry written in three languages widely spoken in London: Arabic, Persian and Somali. * Al-Saddiq Al-Raddi is widely regarded as one of the leading African poets writing in Arabic. His Collected Poems was published in 2010. A distinguished journalist, he was forced into exile in 2012 and now lives in London. * Caasha Lul Mohamud Yusuf is one of the most exciting young poets of the Somali diaspora. She came to the UK in 1990 having fled the Somali Civil War and now lives in London. * Reza Mohammadi was born in Kandahar in 1979. His three collections of poetry have gained him many awards, such as from the Afghan Ministry of Culture in 2004 and prizes for being Iran’s best young poet in 1996 and 1997. * English translations will be read by Sarah Maguire (founder and director of the Poetry Translation Centre) and the poet Clare Pollard. The Bowler Hat, Paternoster Square, London EC4M. Nearest tube station is St Pauls. ** Follow Poet in the City’s Blog, Twitter account: @PoetintheCityUK, or Facebook page for more information about upcoming events. ** Follow @brunelwriter on Twitter for information about events, competitions and job opportunities in the world of writing! This entry was posted in Event, poetry and tagged Bowler Hat, City Lyrics, Event, Living London, London, London Calling, Poet in the City, Poetry, Spoken Word by brunelwriter. Bookmark the permalink.